Apple on Saturday released a pair of video ads for the iPad Pro, concentrating on some of the possibilities brought with September's iOS 11. The first, "Augment Reality," shows an actress using an ARKit-enhanced app to drop furniture into a public park. In the second, "Take notes," the same actress sits in a tree, using an Apple Pencil and iOS 11's drag-and-drop features. Both spots are only 15 seconds long, and use the song "Go" by Louis the Child. 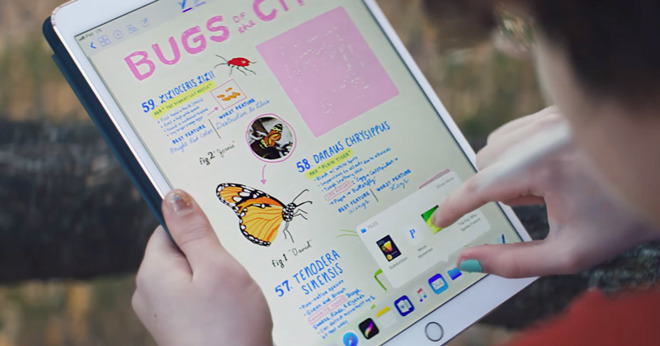 The iPad often takes a backseat to the iPhone in advertising, but Apple has been intensifying its efforts to cast the iPad Pro as a legitimate replacement for a laptop. iOS 11 in particular introduced several Mac-like features, some others being a new dock and a dedicated Files app.